According to IDEO you can prototype anything, so I thought I would put it to the test. Two months ago we adopted Milo, a 3 year old lab cross, so the last couple of months have been about getting used to each other. We have been very lucky with Milo as he already knows things like sit, down, where to go toilet and how to sleep in the car but he also knows how to open doors. Not a big deal, the only one he can really open is the back door out to the garden and this can be quite useful as he is not very vocal, except when he finds hedgehogs, so he does not always tell us if he needs to go out. However he does not seem to know how to shut the door when he comes back in, and as the evenings start to draw in, it does mean he is letting all the cold in. No big deal right now, but not so good once winter gets here. 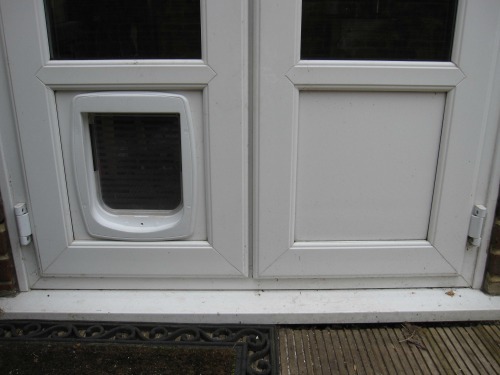 The back door already has a cat flap in it and we were talking about replacing that panel, but now we found ourselves wondering if we could in fact replace the cat flap with a dog flap? 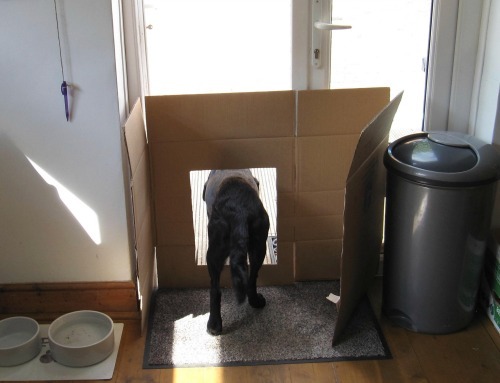 The door is a bit of a weird size and we were not sure what size we would need for Milo to go through, so I found one of the packing boxes from the house move and cut a hole in it about the size and placement of a dog flap. Would he fit? Yes he did, no problem. 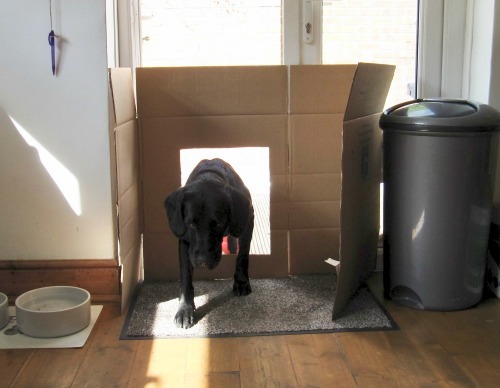 So now I feel more confident in ordering a dog flap, knowing that he will at least fit and with a bit of training he will probably be happy using it. This is why we prototype our products before we build the final thing. Although I cannot test if he will be happy pushing a door open to get though I do know that the size is about right and he was happy to use it when it was just a hole. If I was testing with my customers I would know now which parts people were happy using and which parts need a bit more work. Prototyping takes away some of the risk, never a bad thing. Note: 3 September 2017. 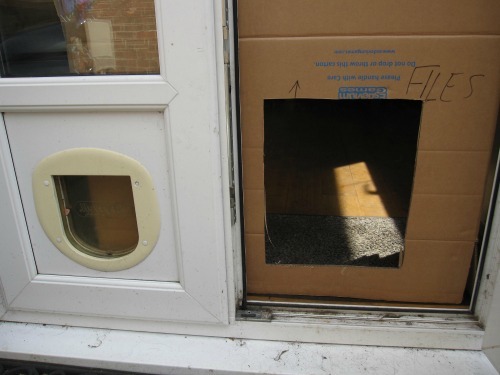 The new dog flap arrived this week and has been installed. While a little low for Milo he can and does use it, although he prefers the door if he can persuade us to open it for him. It is good for sticking your nose out of and having a good sniff though.